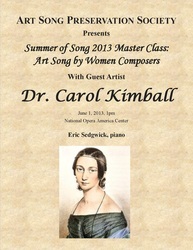 ASPS is pleased to announce our upcoming workshops and our 2013 "Summer of Song" Master Class and Recital Series. 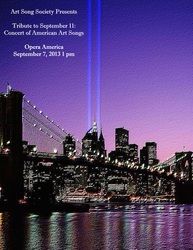 Highlights include master classes with some of the most distinguished music professionals in the world; a moving tribute concert of American Art Songs in memory of 9/11; and the highly anticipated recital of the 2012 Mary Trueman Vocal Arts Competition winner Michael Weyandt, Baritone and internationally acclaimed piano collaborator, Thomas Muraco. Also, don't forget to check back soon for information pertaining to our upcoming Francis Poulenc Music Festival! this fall! Overview: There will be a brief lecture by Blair Boone on Duparc, Chausson, Cras and Duparc's Orchestrated Mélodies before singers are invited to participate in an afternoon of art song singing by these composers and their contemporaries. 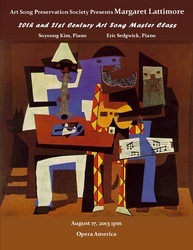 Exceptional piano collaborator, Eric Sedgwick, will be on hand to accompany any singers wishing to perform. Please contact Blair Boone for further details or if you wish to participate. 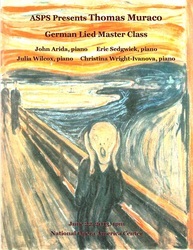 Lieder Workshop: Take me to your Lieder! Songs by Brahms, Mahler, Schubert, Schumann, Strauss, Wagner & Wolf - Sold Out! Overview: Singers are invited to participate in an afternoon of art song singing by these leaders of lieder. Exceptional piano collaborator, Eric Sedgwick, will be on hand to accompany any singers wishing to perform. Overview: Singers are invited to participate in an extraordinary afternoon with one of the masters of German Lieder interpretation, Thomas Muraco. Thomas Muraco has partnered in performance with some of the worlds most renowned singers like Adele Addison, John Aler, Martina Arroyo, Arleen Augér, John Cheek, Phyllis Curtin, Mary Dunleavy, Faith Esham, Maureen Forrester, Denyce Graves, Ben Heppner, Sumi Jo, Chris Merritt, Roberta Peters, Hermann Prey, Jennie Tourel, and Benita Valente. In honor of the 200th anniversary of Wagner's birth, singers are encouraged to include a Wagner selection on their repertoire list if desired. Overview: Singers are invited to celebrate French Independence Day (Bastille Day, July 14th) by participating in an afternoon session of exploration of French Melodie given by a leading exponent of French Song and master teacher at the Juilliard School, Thomas Grubb, whose mentor was Pierre Bernac, the noted French baritone and author of The Interpretation of French Song and of Francis Poulenc: the Man and his Songs. An illuminating and enjoyable afternoon is promised to all. 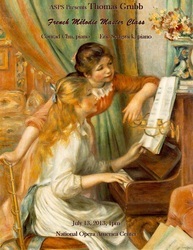 In honor of the Semii-Centennial of the death of Francis Poulenc, singers are encouraged to include at least one of the composers songs on their repertoire list. 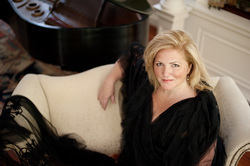 Overview: New music has been central to this Metropolitan Opera singer's career, and she has been honored to work with some of the most gifted composers of the 20th and 21st centuries. Singers are invited to participate in this afternoon learning from Ms. Lattimore. In honor of the 100th anniversary of birth of Benjamin Britten, singers are encouraged to present song by this famed composer on their repertoire list. 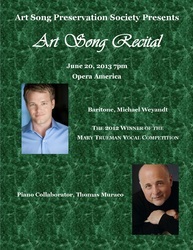 Overview: An evening of French, German and American Art Song with the winner of the 2012 Mary Trueman Vocal Arts Competition, Michael Weyandt (baritone) with internationally acclaimed piano collaborator, Thomas Muraco.